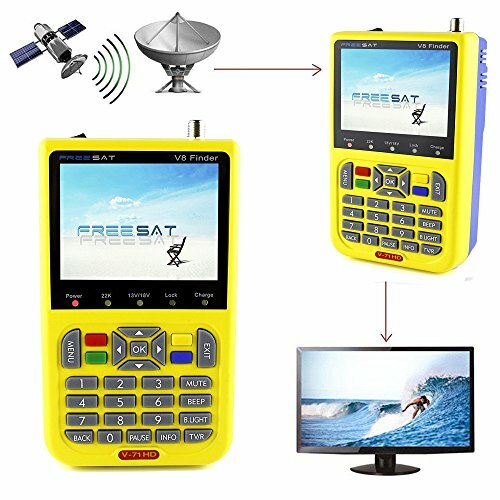 How to Add Sat Names ▶ We have preset many sat names.Besides, you can add other sat names manually.Input the name and longitude, then add the transponder of this satellite.There are many transponders on one satellite, you can go to the https://www.lyngsat.com/. The website shows many Frequency, just like 3650V,3670H etc. these are Transponders, you MUST add them. Then after you add all Tps, you can choose the bind scan on one sat you like. More Functions ▶ Apart from the function of adjusting dish and receiving the FTA channel. It has other functions. First, some customers like to use it to watch tv, but the screen is just 3.5inch, not so big, Second, our machine can be used to adjust the surveillance camera，you can use the AV cable to connect the V8 machine with the surveillance camera, then adjust the position or area of camera. It is so helpful. Fully DVB Compliant ▶ Live FTA digital picture and sound. Support Live-time audio output, clear FTA digital picture played on 3.5 inch high definition TFT LCD colorful screen. Automatic save for last channel. Buy with Confidence ▶ 3000mAh Li-Ion battery included, works for more than 4 hours after full charged; Come with a protective bag and a car charger for easier outdoor using. Please always feel free to contact us if you have any problems. If you have any questions about this product by AMDMY, contact us by completing and submitting the form below. If you are looking for a specif part number, please include it with your message.